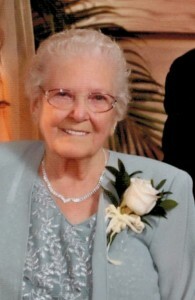 Anna B. Leonard, 86, of Warren, PA died Wednesday, September 5, 2012 in Warren General Hospital. She was born March 13, 1926 in Sharon, PA to the late Finley and Ruby Shook Beatty. She and her husband, Louis B. Leonard owned and operated a family farm on German Hill for 42 years and was a former resident of Youngsville, PA for 10 years and has resided in Warren since 2001. She was an avid crochetier, cook and enjoyed needle point. She was a talented gardener, having brought many plants back from the brink. Her greatest joy was spending time with her grandchildren and great grandchildren. Anna is survived by her daughter – Patricia A. Hemmerly and her husband, Ernest of Youngsville; two brothers – Finley “Bud” Beatty, Jr. and his wife, Jackie of Mercer, PA and Chester “Chub” Beatty of Farrell, PA; a sister – Estella Baumgratz of Earle, AR; eight grandchildren – Timothy Pence, Joe Pence, Adam Pence, Dana Pence-Nelson, LuAnn Leonard, Michael Leonard, Janice Leonard-Moore and Charlie Leonard; 17 great grandchildren – Shane Pence, Stephanie Pence-Theuret, Kane Nelson, Riley Nelson, Wade Nelson, Olivia Nelson, Anna Pence, MacKenzie Pence, Madison Pence, Sadè Moore, Jordan Moore, Skylar Moore, Jayden Moore, Jason Moore, Charlize Leonard, Ashlee Leonard and Charles Moore; daughter in law – Susan Leonard of Temecula, CA; and many nieces and nephews. In addition to her parents, Anna was preceded in death by her husband, Louis B. Leonard, whom she married July 3, 1941 in Maryland; two sons – Louis E. Leonard and John T. Leonard; and a sister – Dorothy Loreno. Our most sincere sympathy at this difficult time. Your Mom will always be with you: and her spirit will live in your hearts forever. I will always remember her sweet smile and that accent of hers. She so looks like my Mom. May she rest in peace and may perpetual light shine upon her all the days of her life. She is finally home.